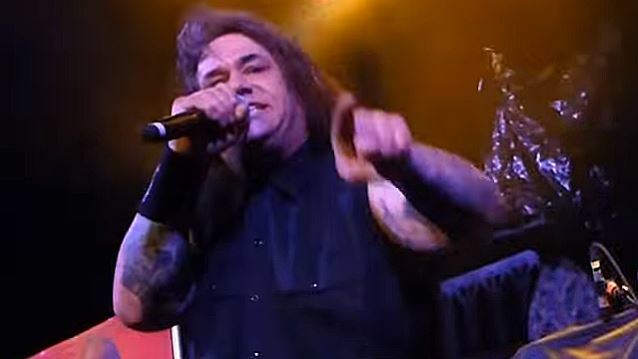 Fan-filmed video footage of EXODUS‘s November 13 performance at the Aztec Theater in San Antonio, Texas as part of this year’s Housecore Horror Film Festival can be seen below. EXODUS is currently touring North America as the support act for KING DIAMOND. EXODUS guitarist Gary Holt is unable to take part in the trek due to his commitments with SLAYER. Filling in for him once again is HEATHEN guitarist Kragen Lum. EXODUS’s latest album, “Blood In Blood Out”, sold around 8,800 copies in the United States in its first week of release to debut at position No. 38 on The Billboard 200 chart. Released in North America on October 14, 2014 via Nuclear Blast, the CD art was illustrated by Swedish artist Pär Olofsson, known worldwide for his incredible renderings that have graced the covers of countless heavy metal albums, including EXODUS‘ “Let There Be Blood”. “Blood In Blood Out” is EXODUS‘ first album since the departure of the band’s lead singer of nine years, Rob Dukes, and the return of Steve “Zetro” Souza, who previously fronted EXODUS from 1986 to 1993 and from 2002 to 2004.